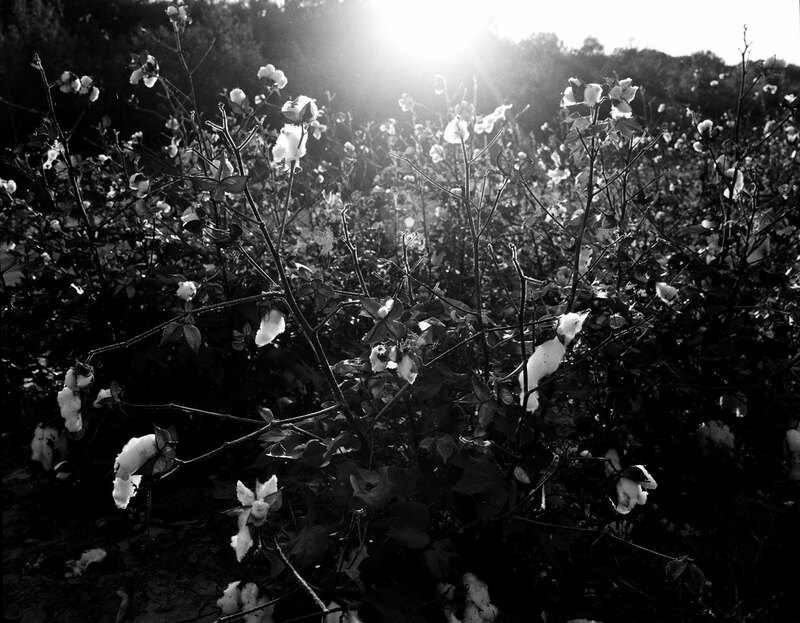 A field of cotton waits to be harvested on the outskirts of Money, Mississippi. This is a tribute photograph taken in memory of Emmett Till and his great uncle, Moses Wright. During the summer of 1955, a 14-year-old black boy from Chicago named Emmett Till was visiting with relatives in the small Mississippi Delta town of Money. While buying candy at a local store, he either whistled at the white lady who ran the store, said "bye baby", or in some other trivial way broke the strict racial and sexual barriers that existed in the South. It really makes no difference, because whatever juvenile infraction Emmett had committed, he quickly became a part of something much larger than himself. He was kidnapped, beaten, and murdered, his disfigured body dumped into the nearby Tallahatchie River. Because his mother insisted on an open casket funeral, for the world to witness first hand the brutality of segregation, and because his killers were quickly set free, even as they freely admitted to the crime, anger over the injustice of Emmett's murder motivated a future generation of young Civil Rights activists-as did the bravery of Emmett’s great uncle, a local sharecropper named Mose Wright who dared to point out in open court the white men who had come in the night to kidnap his nephew. When traveling to a historical site, I’m always thinking about how to photograph something that happened many years ago. Money Mississippi was, and is, a cotton town. All that remains there now are fields of cotton and a cotton gin. While two white men-Roy Bryant and J.W. Milam-murdered Emmett Till, with the help of local white and black friends and neighbors, it was the cotton that really killed the boy, and so many others before him. A cash crop requiring intense manual labor could only have been a child of slavery. To travel in the Delta today is to visit one ghost town after another. The large industrial farm machines that replaced the field hands accomplished what the white supremacists could not, driving the region's African Americans up the Mississippi, towards the jobs.